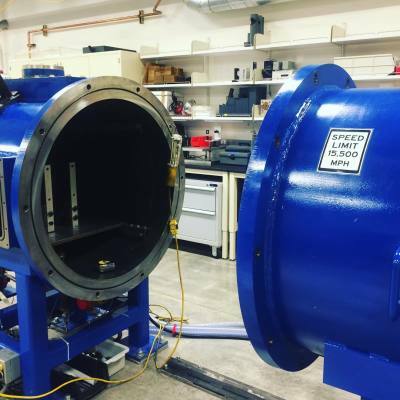 To accurately simulate sub-giant impacts, including the extent to which these impacts result in melting and vaporization of the planet, it is necessary to quantify the behavior of these materials under a range of dynamic conditions. For my postdoc at UC-Davis, I will be using a variety of dynamic compression techniques (guns, lasers) to explore the melting and vaporization behavior of minerals common in terrestrial planet mantles, including those below. The long-lived radioactive decay of U, Th, and K may be important for the energy budget of Earth's core and subsequently the existence of its magnetic field through geologic time. I am studying the likelihood that these elements could exist in Earth's core in significant quantities. 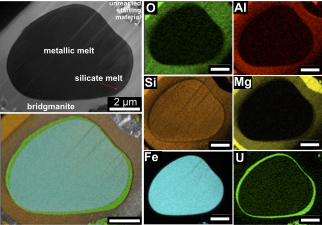 This is accomplished by conducting metal–silicate partitioning experiments of these elements at conditions relevant to core formation, then recovering the samples using cutting-edge sample recovery techniques (FIB). The partitioning behavior is then parameterized as a function of pressure, temperature, and chemical environment. This parameterization can then be fed into core formation models to determine the extent to which radioactive elements would have partitioned into Earth's core. Along the way, it has become apparent that other nominally lithophile major elements, including Mg and Al, may also be important for the core's energy budget. Understanding how U- and Th-bearing minerals behave under extreme conditions is imperative for predicting the behavior of nuclear fuels and their resulting waste. It is also important for inferring the likely hosts of these long-lived heat producing elements in the deepest part of the Earth. During my Ph.D. at the University of Chicago, I studied the behavior of UO2 and ThO2 under the P-T conditions of the lower mantle in the diamond anvil cell. The first publication on the subject can be found in American Mineralogist.